This is it....our newest shetland yarn blend. A lovely soft squishy 3ply, sold in 50 gram skeins. Contains 85% shetland lambs wool-15% qiviut-Musk ox, at $9.95 a skein its not too pricey. the natural colour is a greyish brown looks quite similar to qiviut yarn in its natural state so would make a gorgeous looking, soft feeling, warm shawl, i blended long 4'' inch qiviut into this batch so we should have a lovely Halo with age....yum.....we can also dye the yarns to any of these shades below if greys not your thing ! 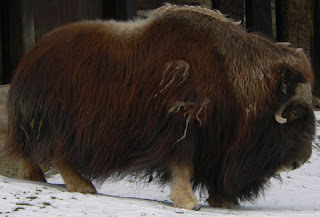 ...... its soft warm down from the musk oxen who live close to the Arctic circle. Their fibre is 8 times warmer than sheep wool and extremely soft and lofty....its a knitting Luxury that is well worth the investment ! to visit my musk ox blog go here: www.theqiviutblog.blogspot.com every month we have a giveaway so do check it out ! 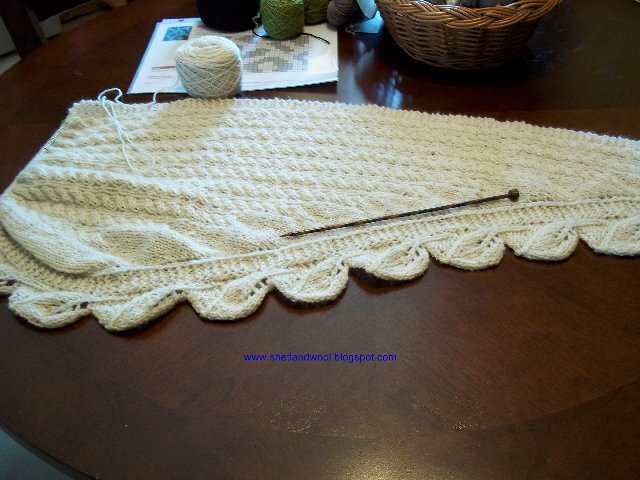 the shawl has a long span of cables running its full width with a lacey Leaf border, some garter sts and lovely yo's, double dec stitches, purly bits and knit side to side. 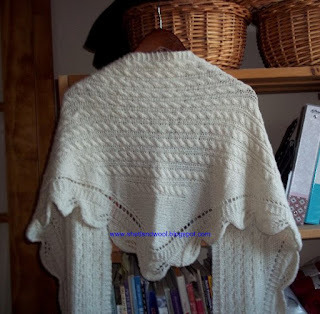 will add more photo's as it knits up. The cables give more bulk to the shawl for added warmth and cozyness ! This shawl is natural white wool from my lovely little Ramy-Boy... a really cute ram lamb who has the most gentle disposition ....only got 1LB of yarn from him so i havent got any for sale. However all our shetland yarns are spun the same weight and gauge so the new yarn above will make the most perfect shawl. We just need a name for this lovely soft blend of yarn, that's where we need your help ! Send us your name suggestions in the comment section, if we choose your yarn name you will be sent the pattern and enough yarn in your colour choice to knit the shawl ! Try not to enter under 'Anonymous' as someone may steal your name entry ! Join the blog followers and you will be sent an email automatically should you be our winner ! Open to knitters world wide, runs from: 4th April 2013 TO 31st May 2013.
gorgeous looking shawl, and that new yarn looks delicious! How about Thistledown wool? Best of luck picking a name! Poppy you won with your ''Shetland Tundra'' entry....pls contact me so i can mail your kit....well done and Thank you ! My names for the Shetland/qiviut yarn are Muskwool or Wooly Musk. How about 'Wild Island Wool'. Beautiful yarn! I'd call it Natural Selection. 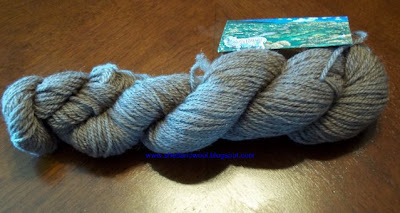 "Shetland Qiviut" or "Northern Sky Knitting Wool". "summerwarm" wool for all those summer evenings with a crispy breeze, especially if you think that it is a gift for shawls. You've just got to call this yarn "Musket"! This is the traditional name for Shetland Wool that is greyish-brown in colour. The name even sounds like musk ox and "shet"-land blended together. Other names for Shetland colours are emsket (bluish-grey), moorit (reddish brown), mioget (honey), shaela (grey). The yarn looks lovely and I can't wait to pet some. I may drop in at Knitter's Frolic just to caress some and give it a good home. You just HAVE to call it the Arctic Lamb :) It just sounds so unique and soft, that everyone will want some in their stash! I tried to find something in common between the sheep and Muskox (hence the kindred spirits name). Muskox are a prehistoric animal, and the sheep are from some of the most ancient breeds (pre 1000a.d.). Both animals live in difficult climates in northern areas where the landscape is very rocky. It will be fun to see which name you pick out of all the great names that have been submitted. Northern Lights? Frostfire? Arctic Warmth? Midnight Sun? Looks like you have many lovely lakes and rivers in your area. You can name a new yarn for each one. I thought of two names for the yarn; Cozy Qiviut, or Shetland Luxury. Oh my, how many names to choose from!!!! Luscious. That's the name. I love it in natural grey. I like "Arctic Islands" blend. Met you at the Frolic, and bought some 100% Qivuit and some blend which is called Qiuit-Queen-Superwash, I was wondering if this blend was named for you, The Qivuit Queen? and if so maybe you should name this blend for your Husband. Best of luck, I'm going to have to come by your booth earlier next year, for more colour choices. PS I'm knitting a cowl from natural and hand dyed 100% Qivuit, it is as soft as advertised, and the boys in my house are not allowed to touch it! Hi Jennifer, yes the qiviut-queen yarn is named after me and designed by my Son Josh who works with us in the mill. We have had so many really great entry names its going to be hard to choose ! Thanks for your entry...happy knitting ! My name for the new yarn would be Downland or Downy or Qudown. I can just imagine how soft and Squishy it is. May you have great success with the new product line! Wild Shetland, or Wild Shetland Blend?